The Olympic Council of Ireland is locked into a contract with the company at centre of Rio ticketing scandal until 2026. THE OIREACHTAS COMMITTEE on Transport, Tourism and Sport has agreed to ask the Sports Minister Shane Ross to commission an expansion of the non-statutory inquiry into the Rio Olympic ticket scandal. In a private meeting held today, the committee decided to request the minister to commission a further review into the awarding of contracts up to and including the Winter Olympic Games to The Hospitality Group (THG). 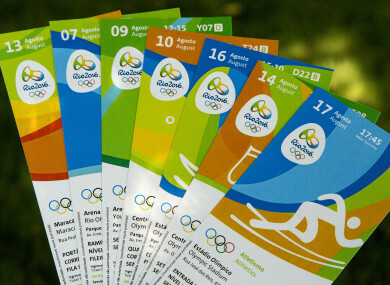 THG – owned by the Marcus Evans Group – was the Authorised Ticket Reseller (ATR) for Ireland during the 2012 London Games and the 2014 Sochi Winter Olympics. Earlier this month it emerged that the Olympic Council of Ireland (OCI) is locked into a “pretty watertight” contract with THG which gives the company ticket reselling rights for the 2018, 2020, 2022, 2024 and 2026 Olympic and Winter Olympic Games. Controversy engulfed Irish sport last August when Hickey and Kevin Mallon of THG were arrested in Rio as part of an investigation into an alleged ticket touting scandal. Justice Carroll Moran’s report into the distribution of tickets for the Rio Olympics made no findings on whether any laws had been broken. Legal proceedings involving THG and Hickey are currently ongoing in Brazil. Both deny any wrongdoing. Moran said THG, Hickey, Pro10 and the International Olympic Committee (IOC) did not engage fully with the investigation. The report found that throughout the Rio Games there were multiple issues with Ireland’s Authorised Ticket Reseller (ATR) Pro10 and the oversight of the OCI. Upon the publication of the report into the ticket scandal, the OCI’s new president Sarah Keane said the contracts had only come to the attention of the executive board in recent weeks. “My understanding is that there is a clause in the agreement that the fact that THG might not have been approved for a previous Games does not impact on the contract for the future Games. “So it’s pretty watertight contract in that regard so we just need to consider it legally and look at it going forward,” Keane said. She stated that this agreement had been signed by Hickey and THG in January 2016. In addition to seeking the expansion of the Moran report, the committee has decided that the issue should be referred to the Director of Corporate Enforcement. It will also request the Public Accounts Committee to look at certain issues around funding of Sport Ireland. Further committee meetings on the report’s findings are to be held in the coming weeks, with the committee stating today that additional witnesses from Sport Ireland and the Olympic Council of Ireland are to be invited to attend the hearings. No decision was made on the issue of compellability to appear before the committee in relation to former OCI president Pat Hickey. However, the committee agreed that the former OCI president should be invited to appear before the committee at the earliest possible opportunity. However, RTÉ reports that Hickey will not be compelled to appear. A request is also being submitted to the Department of Foreign Affairs to seek an update on court proceedings in Brazil relating to the distribution of tickets for the Rio Olympic Games. “The committee will also be contacting the ambassador in Brazil, but we’re acutely aware of the need not to interfere with the inquiries by authorities under way there,” said O’Dowd. While today’s meeting was in private, it is understood that some members suggested that a new committee be established in order to conduct a full parliamentary statutory investigation into the Rio ticketing affair. Others suggested the committee be given the power to send for persons or seize documents, however, Dáil approval would be required in order to do so. Email “Committee wants to know why OCI is locked into contract with company at centre of Rio scandal”. Feedback on “Committee wants to know why OCI is locked into contract with company at centre of Rio scandal”.